Plain and simple, pigs are herd animals. They form very close bonds to the other members of their herd, but integrating a new pig into the herd is a task that requires patience, diligence, and a bit of thick skin. Pig instinct is to establish dominance—and to establish dominance, pigs will fight each other. As animal lovers, watching the pigs fight is difficult and almost heartbreaking, but one must be aware that this is normal pig behavior and is a necessity in the process. 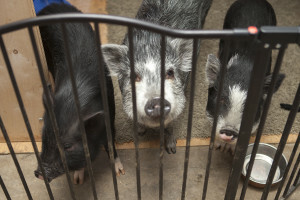 Before bringing a new pig into your home, there are a few steps you should take to prepare your environment for acclimating your existing pig(s) with the new addition. It is best to keep the pigs completely separate for a period of time; to do so, you must have areas where the pigs may see each other, but cannot come into physical contact. 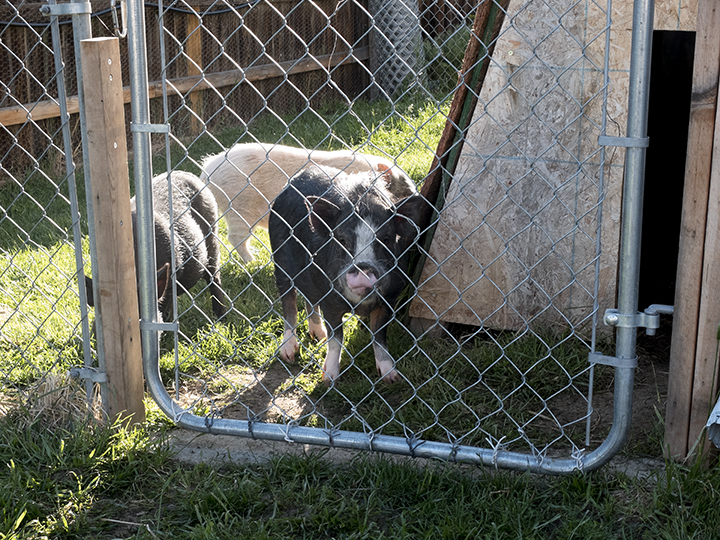 We recommend metal wall mount pet gates (you can purchase these from $35-$100 online or at pet stores) and maintaining separate areas of the house for the different pigs to stay in. Rotate the pigs between house and yard at separate times, too. It is helpful to have several pens within your yard if you have the space to do so; we have a large backyard that is divided into 3 sections of chain link fencing. Our three permanent resident pigs can enjoy their own space, and the rescues we bring in can feel secure as well. The following pictures show three pigs in pen 1, and three pigs in the house separated by a wall mount gate. Keeping this schedule for a minimum of one week is important. You must pay equal attention to the new pig, to build trust, and to your existing pigs to show respect and to keep your existing routine fairly normal. A two-week separation period seems to work the best for us. 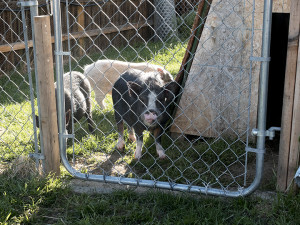 After two weeks, we will slowly let the pigs into the bigger portion of our yard to feel each other out without fences. In the event that you have more than one pig to introduce to the newcomer, try to introduce them one at a time. You should know the chain of command with your existing pigs; start with the most dominant pig. Ease them into the meeting as well—put each pig out separately, with a bit of time before meeting (say 10-20 minutes). They may choose to ignore each other at first, and then become aggressive to establish their ranks. 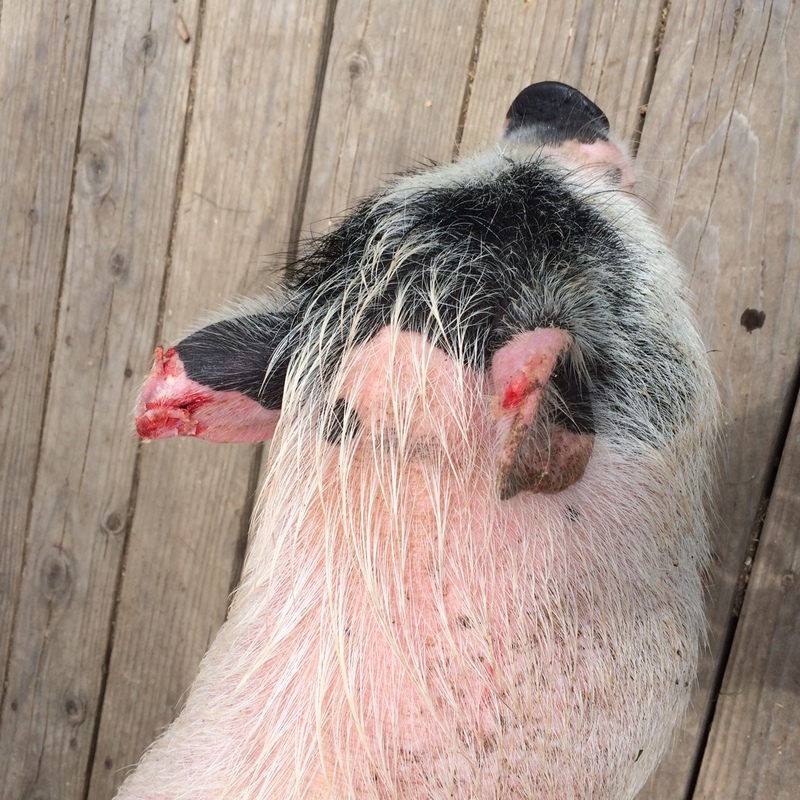 Allow the pigs to fight, but not to the point they cause severe injury and need veterinarian attention. 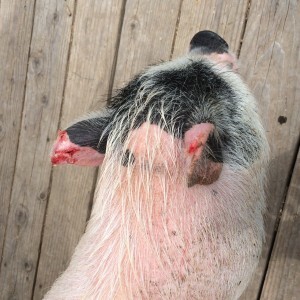 Pigs are resilient, however, and so long as you keep any bites/scratches/wounds clean, they will heal relatively quickly. It is best to not do this step alone! Have someone else in the yard to help separate the pigs if needed. If you are uncomfortable in this step, you need to practice certain dominance training procedures first, such as move the pig, so that your pig responds to you as the alpha. When we introduce pigs this way, one person will “herd” each pig simultaneously in opposite directions. We will guide one pig to a separate pen, the other towards the house. Once you break up the fight, keep them separated the rest of the day. You don’t want to push your luck, and it’s better to offer small intervals throughout the week for introductions. Usually within a month time frame, the fights will be over with, and you can trust leaving the pigs alone together. 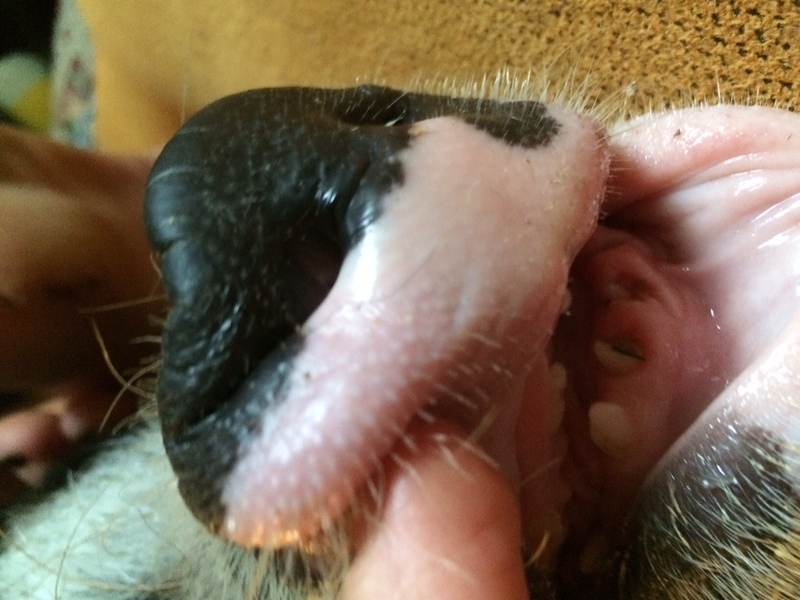 In the following pictures, you can see results from fights; the first is broken teeth from fence fighting, and the second is chewed ears from a physical fight. The time period for separation varies: do not expect typical results, as every pig is different. For example, if you have a pig that is used to all of your attention, and has been the only pig in the household for a long period of time, the adjustment may take longer than you’d like. Do not give up! Once they determine their rankings with each other, they will become family to one another. < Previous Why pigs? And other answers to other questions. Next > Donation dollars at work!